It is with a heavy heart that we say goodbye to our friend, colleague and inspiration, filmmaker Jonathan Demme. To honor his memory and to celebrate his life and important body of work, IFC Center presents a special screening of his landmark documentary STOP MAKING SENSE, in collaboration with dozens of arthouse theaters across the nation. Over the years, we had the pleasure of hosting Demme for many screenings of his films, both narrative and documentary. Last Fall, we were proud to showcase his nonfiction work in a six-week retrospective in our Stranger Than Fiction series, in advance of DOC NYC’s presenting him with a Lifetime Achievement Award from the festival in November, 2016. A warm, generous soul and an immensely talented filmmaker, Demme will be deeply missed. We hope you’ll join us in paying tribute to a great artist and a great man. Screening followed by a taped Q&A from 2014 with Jonathan Demme and David Byrne, moderated by Janet Maslin. “It’s apparent that this is a rock concert film that looks and sounds like no other. The sound is extraordinarily clear, thanks to the pioneering use of 24-track digital recording. And the film’s visual style is as coolly iconoclastic as Talking Heads itself. Mr. Demme has captured both the look and the spirit of this live performance with a daring and precision that match the group’s own. It’s worth noting some of the things that are not to be found here: screaming crowds, gaudy skintight costumes, candid scenes of the band members backstage. 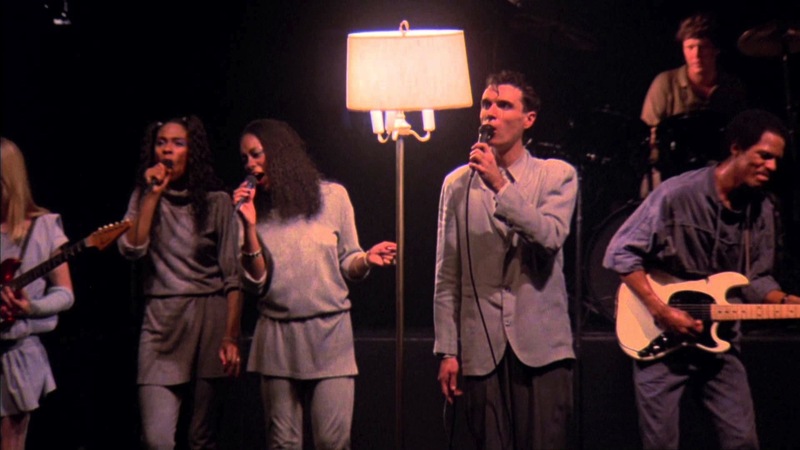 Talking Heads’ performance style is unlike anything that has ever been captured by a standard concert film, and Mr. Demme is very well attuned to the group’s eccentricities. Even the first image – the shadow of a guitar neck looming against a white wall – wittily suggests the menacing and mechanistic qualities of Talking Heads’ music, as well as the clean, bold visual imagery they manage to make so surprising. The sight of this sexually and racially integrated nine- member ensemble, in white sneakers and neutral-colored playsuits, jogging in place as if practicing aerobics becomes at least as exciting as any standard rock spectacle.